“Uh-oh. This is bad, bad, bad, bad, bad…” | Que Sera Sara? When I was 5, my mom’s sister came to visit. My mom was so excited. I think they talked non-stop for days. “Take your sister and go play upstairs” my mom ordered. I guess they were talking about grown-up things. On this less than inspiring afternoon, we rummaged in the art supplies. 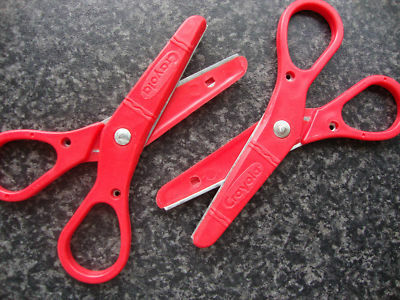 Did you ever have those little kid scissors? The rounded tip ones deemed safe for tots. These “safety” scissors were the bane of my artistic life. They were too blunt to cut fingers and pretty much any type of paper. They were not, as it turns out, too blunt to cut hair. The first snick resounds in my ears. Pantomime barbershop has taken a turn for the worst. I am surprised but not yet panicking. I could probably even it out. There is hair everywhere. On the floor, on my fingers, on the tell-tale scissors. My mom’s laughter echoes up the stairs. So, I casually (read: not at all) go outside and climb the tallest tree in our garden, giving myself buffer time for when the bomb drops. I sit on my favourite branch and wait for what feels like for ever. Sure whatever comes next will be awful. Unless… unless Mom is having such a fun time with her sister she doesn’t notice straight away. I am very hopeful Kate’s hair can grow fast. Or if Mom does notice, I hope beyond hope that my aunt’s calming influence will help me get off lighter than I would have otherwise. I pray they’ll keep laughing. Maybe it will be funny? I don’t remember what happened next or what dreaded punishment was decreed. I certainly don’t remember what explanation I offered under interrogation. Two Little Girls Explain The Worst Haircut Ever (Audio). I can tell you for a fact that I wouldn’t have been as eloquent or as logical as this pair of sisters, interviewed while in a similar situation. They are my current favourite thing.